Academic Performance - Studies show that students involved in athletic programs maintain a higher GPA and achieve higher test scores. 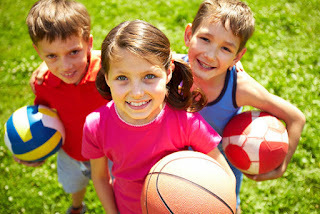 SPARKpe.org provides a list of recent studies proving the correlation between academic success and physical fitness. Fitness Habits - Sports help students develop coordination and teaches them how to care for their bodies through proper stretching and the development of fundamental mechanics. Participating in athletics at an early age instills physical fitness habits that carry over into adulthood, helping to avoid health problems. Mental and Emotional Benefits - Athletics have great physical benefits, but also help children to improve mentally and emotionally. While the body exercises, the brain releases endorphines. From a biological standpoint alone, students who are physically active are happier and have a constructive outlet through which to relieve stress. Development of Specific Skills - Through athletics, students are able to accumulate a whole host of skills and abilities. Leadership, teamwork, confidence, and self-reliance are the big character focuses. Critical thinking is developed on the playing field as athletes need to quickly solve problems created by their opponents. Time management, a skill necessary in adulthood, is also brought into play as children learn to balance their time between schoolwork, sports, and family life. For more student athlete information, as well as great drills and exercises, visit the Fairmont Pinterest board Student Athletes!